The pack critically endangered Mexican gray wolves named for John Morgart, the former coordinator of the program that has been trying to restore them, is gone. Fish and Wildlife Officials told the Albuqueque Journal (subscription required) that the female was found dead and the male is missing. The agency declared the wolves, formally known as F1106 and M1155, a pack a few months after they started travelling together this spring. They named them after Morgart, a willdlife biologist who went one-on-one with locals to work for the wolves; he died in October, 2009, of cancer. F1106 was captured and moved into New Mexico in late 2008; that means she probably got into trouble with ranchers. M1155 was born in the wild to the Hawks Nest Pack in 2008 in Arizona. Imagine the alarm bells that should be going off when a critically endangered species loses 15% of its wild animals in five months. That’s exactly what’s happened with the Mexican gray wolf. 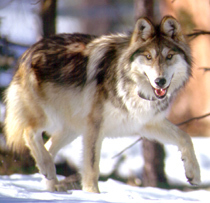 These are the fifth and sixth wolves to be found dead or go missing this year. Are Undescended Horse Testicles Getting in the Way of a Sanctuary? WolfWatcher.com | Understand. Love. Protect.